I recently received the following question about how to choose a smaller understory tree. 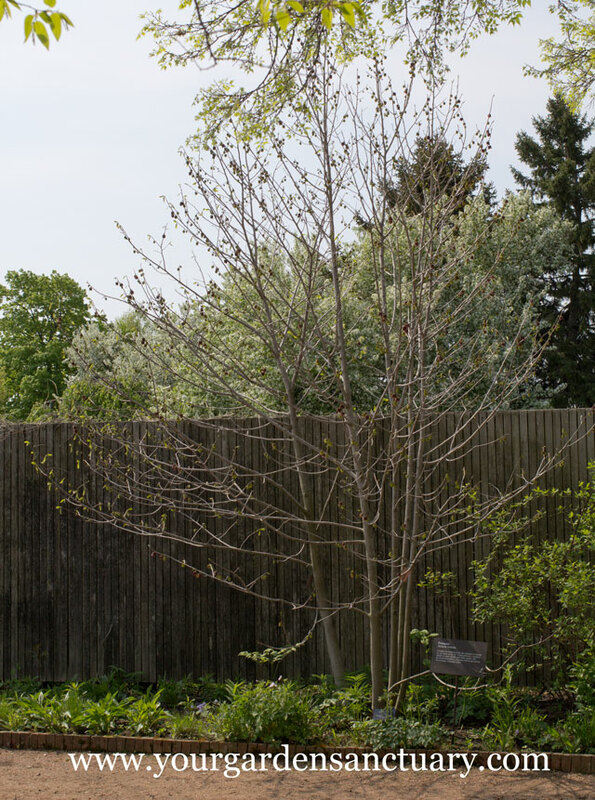 I have a small backyard, and I’d like to add a two or three small deciduous trees or shrubs that will form distinct trunks…There are some good native understory trees, like redbuds, witch hazels, hornbeam, etc. These all come in standard varieties and dwarf varieties. Is it better to choose a dwarf variety or to plant the standard variety and prune it? Great question. There can be many different goals to pruning. 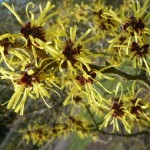 However for the majority of the pruning I do, one goals as I have written about before is keeping your plants smaller. Most people do not have the time or skill required to make their tree look it’s best, especially when trying to limit it’s size. Even if you can, you might not want to have to do it. I am all for trees that look great and stay small enough to fit their spot without a lot of pruning. Fox Valley River Birch which grows about 12 feet in 15 years instead of a Heritage River Birch which can get 40-70 feet tall. Vanderwolf Limber Pine which grows 40-50′ tall and only 20′ wide instead of a white pine which could grow to 60-80′ tall and 40′ wide. Threeflower maple and Paperbark maple, two outstanding trees which won’t get much taller than about 25 feet. 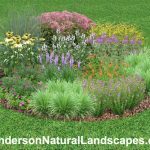 Heck, I have even written an entire post about why we should consider planting smaller shade trees for our landscapes. That said, most trees can be kept quite a bit smaller than their normal height with consistent pruning. The under story trees I listed below can be kept to around two thirds of their normal height with an annual pruning regimen. I also included one shrub that can also provide some distinct trunks with pruning. 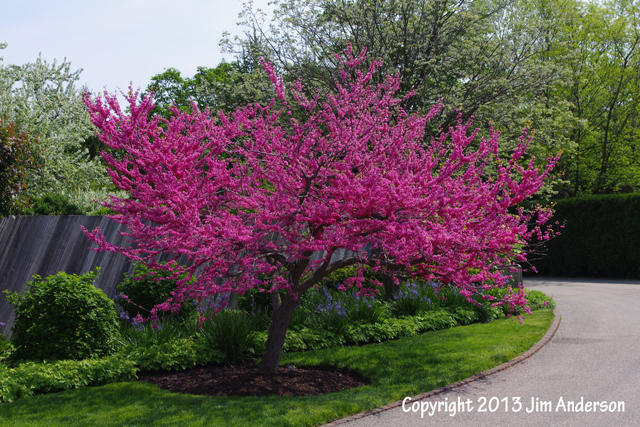 A dwarf cultivar of these trees could meet your size requirement needs and require less (or no) pruning. If you want to find a dwarf version I would look it up in Dirr’s Manual of Woody Landscape Plants* which you might be able to find at a local library. You could also just Google “dwarf” + the plants name. If the dwarf version of the tree you want is available in a size large enough you would be happy with today. Buy it. If not, get a smaller sized dwarf version of the tree and curse me for suggesting you buy a dwarf because it is taking forever to grow! 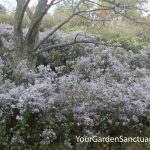 Buy the regular version of the plant and commit to learning how to prune it annually. I started with this tree with big tropical like leaves because if you like how it looks, it meets the needs of a small understory tree with distinct trunks. It can be difficult to transplant and should be planted as a small tree (3-6′) to have better luck with it. It is a great native tree for gold to yellow fall color. It will be more open growing in deep shade. If you only plant one, you will not get fruit as you need two different cultivars for fruit to be produced. I have never pruned these. But their form looks fairly simple to prune back with simple heading cuts on 1st year wood. Growth rate: Slow. Averages 8-10 feet in 10 years. Does best in moist soils, but tolerates drier sites. Can be difficult to transplant and is best planted small. Moderately slow grower. It has a good yellow to orangish fall color. Seems to tolerate pruning fine, but does not look it’s best with heavy pruning. Light and frequent pruning is better then one heavy pruning session every few years. Rosy pink purple flowers open on bare branches in early spring. Pale yellow fall color. Enjoys moist well drained soil. Does not tolerate water stress well especially drought. Can bounce back from a severe pruning and grow four feet in a year. You have to anticipate that and prune it quite a bit smaller than you want it to be the next year. The Appalachian Red Redbud (Cercis canadensis ‘Appalachian red’) has a different color flower that sets it apart. If I was buying another redbud (I have two small ones), I think I would have to get this cultivar even though it is kind of gaudy in flower. Interesting horizontal layered branching. White flowers in late spring not as showy as flowering dogwood, but still attractive. Fruit turns from red to dark blue in late summer. Does best with cool shaded moist sites. Light pruning is best as these trees have an architectural effect with their layered branches already. May not be the best candidate for heavy size control pruning. It is better to use light pruning to enhance the plants natural branching patterns through thinning out small branches, etc. White flowers appear in early spring and are followed by very tasty edible blue berries in early summer (June). You will have to beat the birds to them if you want to indulge. Does best in moist soils, but tolerates dry sites. Yellow to red fall color can be excellent. Service berry are best kept smaller through annual less severe pruning. Try to avoid making large pruning cuts if possible on service berry as it can effect its health as well as ruin the natural aesthetics of the tree in my opinion. White clusters of flowers in spring, followed by bright red fruits in the fall that often last well into winter. 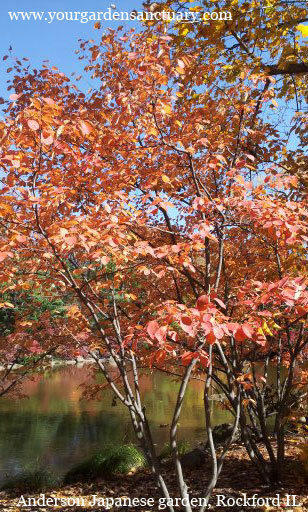 Fall foliage color ranges from yellow (more in shade) to red (more in full sun). 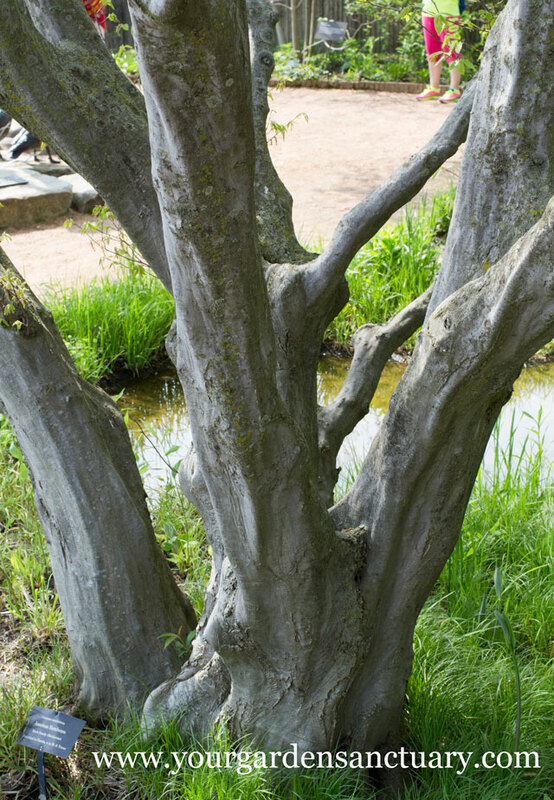 This is a shrub that can tolerate heavy pruning and develop a nice branching structure. These are my favorite shrubs to prune, as they can be developed over a few years into a near sculptural form. That is unless it is attacked by viburnum borer and half of the plant dies. If you are near a natural area this is more likely to happen. You can control borer with insecticides. 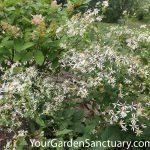 This is one of my favorite shrubs to prune every year. 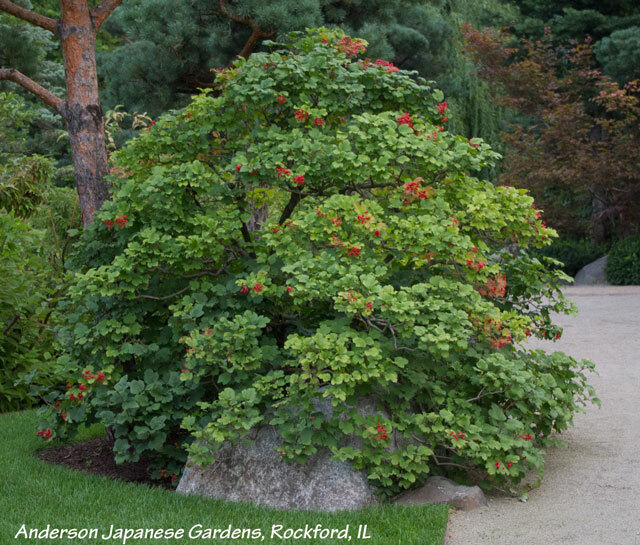 This viburnum trilobum would not look this way without annual pruning. Thanks for the suggestion Kay. I am a Samsung Galaxy user, but if I had an Iphone I would give Dirr’s app a try. It does not look as quite as detailed as the book, but would be a lot easier to carry around on a trip to the nursery if you wanted to look a plant up. I have to admit, I have brought his book on shopping trips to a nursery before, but I leave it in the car so I don’t get too many strange looks. I’d like to plant an evergreen tree/shrub with some height in a flower bed 3 ft. from the home/foundation. I really like the look of the Blue Atlas Cedar but know it can get huge and my biggest fear is planting something that will adversely affect the home foundation. Could I get away with a Hotsmann Dwarf Blue Atlas cedar and keep it pruned if needed? 3 Feet is too close for that plant eventually. These will get to be 20 feet tall eventually, the size stated in catalogs of 10 feet are 10 year sizes. You could always prune it as it grows or remove it when it gets too big. I read your related articles on understory trees in tight spots but I really like the look of the Horstmann and I’m fine pruning it and could actually plant it more like 4ft from the home and front porch but specifically want to know about whether it would adversely affect the foundation and front porch planted 4 ft away. Another option I like is the Karl Fuchs Deodara Cedar and would keep it pruned as well as long as it wouldn’t affect the foundation. 4′ from house with pruning should be fine. Thanks so much Jim, one last question-would you recommend the Horstmann over the Karl Fuchs or does it matter? I am not really familiar with either enough to give an opinion. Zone 5 cold here too chilly for them. I just found this great post – thanks so much for sharing your wisdom. I wondered if I could get your input on my question. I have a #7 summer snow hemlock that I purchased for elsewhere in my yard but now don’t need it there. It don’t want the $125 tree to go to waste… so I’ve been looking around. (When I bought the plant, the website I used had listed dimensionsof 4′ width at maturity, but I’ve since read 8′ and 10′ on other websites. I have 3 other established summer snow hemlocks in my yard and have had no trouble keeping them pruned to 3′ so far, though they’re still fairly young. Anyway, I would love to put it outside our porch windows, where it would block our view of an ugly air conditioner. But that’s only 3′ from the house and only 2′ from a metal window well. I love pruning, it’s no problem for me. And I’m fine with eventually removing the tree when it gets too big. My main concern is whether it’s roots could damage the window well or house, and whether watering so close to the house is wise. Do you have any guess as to it’s root structure, or input on this? Thanks in advance for any thoughts. I don’t know the condition of your foundation, but I don’t think of dwarf hemlocks as having aggressive root systems. Yes it would outgrow the spot without pruning, but as long as you see it as a temporary plant it probably is ok.
You could also give or sell to someone else that has a spot for it where it could be left to grow. Thank you very much! This is very helpful, and your blog is a wonderful resource! Regarding giving the tree away – I thought about it, but it seemed wrong to do so at this point in the season – I feel like it will have a high chance of failure at this point. Have you found that planting evergreens in fall is risky? That’s good to hear. Thanks again.